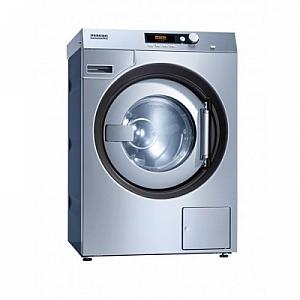 Miele PW6080 8KG Washer from Gillmans Commercial Appliances. 3 heater elements with an 8kw heater rating enables programmes as short as only 53mins. Stainless steel drum drum flange and suds container resistant to wash liquor and disinfectants. Dump valve and drain pump options. `Container empty` signals from 6 suction tubes can be processed to ensure a sufficient supply of additives at each stage of the programme. Price for PW6080 Drain pump Blue front lid and sides other options and colours may vary.